Centuries old, stone built, corner property in the centre of the village. 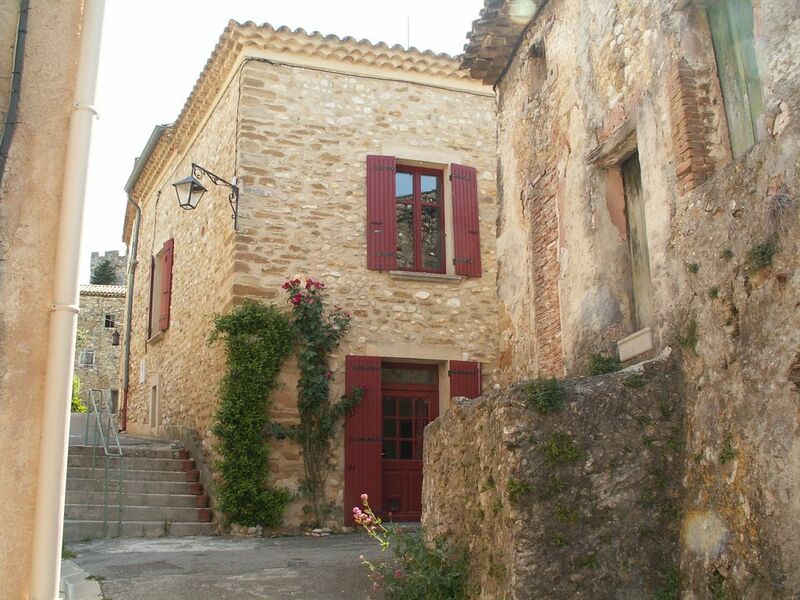 Attractive frontage with deep red door & window shutters.A short stroll to the main square with cafe/bar. Front door opens into a warmly decorated lounge with wood burning stove, satellite TV. Lounge leads into a hallway, off which is a bathroom with shower and wash handbasin, plus a utility area with washing machine and freezer. Separate WC. On 3 levels,stairs lead up to 2 good size bedrooms. Main bedroom has double bed, attractive antique cupboards, a bath with shower & wash basin. 2nd bedroom has twin beds, a wash basin & hanging space. The HUB of the house is the light & airy kitchen/diner & roof terrace on top floor. Kitchen has oven,grill, induction hob,microwave & fridge. Living area has pine table to seat 6/8 plus sofa. Casement doors lead onto a large terrace with stunning west facing views and sunsets. Outside dining for 6 and raised decking area for sunbathing with UV protected sun canvas. Provence at its best. ACTIVITIES & SIGHTSEEING: Walking - plenty of scenic walks in the Dentelles, or even starting from your doorstep. Cycling - lose those extra calories by cycling from one hilltop village to the next. If you're mad, you can even cycle to the top of Mont Ventoux and while you catch your breath the amazing views will take your breath away again! Canoeing or swimming in the gorges of the Ardeche. Horseriding - 3 equestrian centres nearby, with training ring. Tennis - 2 courts in Villedieu. Dining - stop for a coffee or a long, lazy lunch in a pavement cafe. Wine Tasting - this is Cote du Rhone country and all the caves offer wine tastings(degustations) to visitors. You are in the heart of Provence surrounded by charming medieval and Roman towns & villages in abundance. Discover and explore the wonderful traditional Provencal markets. The Mediterranean is just over an hour away (don't miss Cassis harbour and beaches). The Cote d'Azur is a couple of hours away. Italy and Spain are a day trip away. Ian & Mandy Moore We live in the Brecon Beacons, Wales where we have our own small business. We left good jobs in the City of London to move to Wales some 18 years ago when we bought a small hotel (formerly the workhouse) on a hillside above the Monmouth/Brecon Canal with magnificent views of Table Mountain. We built up a flourishing business and sold the hotel after 10 hectic years, by which time we knew we wanted to stay in Wales and not return south. We took a year out and travelled. We are now settled in a pretty hamlet in this lovely rural area with mountain views of the Brecon Beacons on our doorstep, and a lot more time to enjoy it. Although very different scenery, the views from our roof terrace were what cemented our decision to buy this house in Provence. We visit our home in Villedieu several times a year, often with friends and/or family and are always impatient for our next visit. We look forward to retirement when we will have more time to make longer visits. The ancient stone walls,the facade of the house with its deep red door and window shutters and the rose bush growing up the wall by the front door were what made us want to view this house, and it did not disappoint. We like the fact that you have summer and winter living, with a wood burning stove in the downstairs lounge and a spacious roof terrace on the top floor. By the time we walked out through the French doors onto that roof terrace and saw the views out across the vineyards we had fallen in love with this house. It wasn't just the views, it was the raised decking area on the terrace with drapes and lanterns giving a mixed Far Eastern and African feel to that area. It was the table and chairs on the terrace offering the choice of al fresco dining as well as indoor dining in the top floor living room with its characterful sloped, beamed ceiling. It was the use of old antique doors to make wardrobe doors and kitchen cupboard doors. All these touches are what made us choose to buy this property and we have no regrets. Villedieu is a unique village - a peaceful hilltop Knights Templar village, with a lively village square and community life. It offers fantastic scenery and is close to the ancient Roman town of Vaison-la-Romaine which has one of the best weekly markets in Provence. Downstairs shower cubicle and wash handbasin, adjacent to the utility room. A separate WC is next door. The master bedroom has a bath/shower en-suite and wash hand basin. There is dining for 6 indoors adjoining the kitchen and upstairs living area. There is also dining for 6 outside on roof terrace. Large roof terrace with outside dining for 6 and decking area for relaxing/sunbathing. There is UVP covering against the sun for both the decking and dining areas. So Close to Heaven! Dem Himmel so nah! As others have said, this is a beautiful old house which has been done up charmingly and appropriately by the owners, but lacking nothing that you might need for a relaxing holiday. The roof terrace is the real star, however, with its dining area, barbie and, of course, the sunbathing four-poster bed. The views across vineyards towards the distant hills was wonderful at any time of the day, but the sunsets were often truly spectacular. The village of Villedieu did not disappoint either. For such a tiny place, it was well stocked with places to eat (including weekly visits by a pizza van and a paella van), a shop where you can order your morning croissant, and a variety of public entertainments, from jazz to Europop. A local vineyard also had a free weekly concert of young talent where you could enjoy their wine and a platter of organic food. Further afield, we enjoyed all the history (especially at Vaison), the walking and splashing about in rivers and swimming pools. Our thanks to Mandy and Ian, who were extremely helpful, before and after. There was only one downside: we had to come back. Thank you Fiona, Nick and Finn - it means such a lot to us when guests enjoy their time in our house and it is always very much appreciated when they take the trouble to write such a glowing review. We are delighted you had such a wonderful holiday. A WONDERFUL WEEK AT MAISON VILLAGE VILLEDIEU! We have just spent a wonderful week at Maison Village in Villedieu. Ian and Mandy's house is beautiful. It is very traditional having kept most of the original features but modernised in a sympathetic way. The views from the roof terrace are superb, we spent many an evening there watching the sunsets! The house is well-maintained and fully equipped and there is nothing the owners haven't thought of. Villedieu is a lovely Provencal village, quiet in the day but vibrant with life in the evenings. It's in a great location, close to all the surrounding towns, countryside and places of interest. A good day out is to Vaison-la-Romaine, only 6kms away. There is a fantastic market there on a Tuesday, also the old Roman town and medieval hilltop quarter with a tranquil river nearby. Other good days out are driving to The Dentelles Mountain Range and Mount Ventoux. There is so much to do and see in this area. We would definitely recommend a holiday here and we will be returning in the near future! Our recent stay in Villedieu was what we were hoping for and more. We were keen to find somewhere we would enjoy spending time in,as well as a base to set off and explore the surrounding areas. The house certainly didn't dissappoint - it is a lovely place to be, is decorated stylishly and the view from the terrace is something I could never tire of gazing at. Villedieu itself is a very welcoming and friendly place and from there we were able to drive around the countryside and soak up the wonderful atmosphere of that part of the world. I've been to the Cote D'Azur many times before but never to Provence and I think it's safe to say that I'm converted - I can't wait to visit again. Until then, the workaday stresses melt away when I remember the sights, tastes, aromas and atmosphere we were lucky enough to savour whilst we weere there. We spent a wonderful week in this amazing gite. The property was so unusual and imaginative but with everything you could need as a base for the hol. Luckily having great weather meant we could enjoy mornings on the sun decking catching the rays and evenings on the terrace with the barbecue full of steak! The village is idyllic, surrounded by vineyards for exploring and a central square which is always buzzing and full of life, even when the rest of France appears to have closed for the day! Villedieu is a perfect base from which to explore the region - with activities such as canoeing, walking, wine tasting all within an hours distance and even the coast not too far away! I would recommend highly and only wish I hadn't had to leave to return to work! We can't wait to return. The owners ensured we were equipped with directions and comprehensive info on the house itself and the surrounding area, thus ensuring an excellent start to our first visit to Provence. The house, whilst centuries old, has been tastefully modernised, providing all the necessary comforts and equipment. A beautful outside space has been created at the top of the house, affording breathtaking views across unblemished countryside, much of it vineyards. Given the rural location, you can be sure of a perfect night's sleep. Parking is a few steps from the house, as is the village centre with two restaurants and the archetypal Cafe du Centre, the local watering hole where splendid wine can be bought by the "pichet" for a fiver. There is also a "Tabac" and "L'epicerie" nearby, as well as tennis courts and the local "Cave". The location is superb, you're just a few minutes from the Roman village of Vaison La Romaine, which has the area's, if not France's, largest weekly market and Avignon is a 40 minute drive. We only stayed for a charming and beguiling week, and left feeling that there was plenty more to discover. Villedieu is a delightful medieval hilltop village (a former Commandery of the Knights Templar) and our house nestling behind the ancient ramparts is set amid vineyards, olive groves & lavender fields. It is only 10 mins from the Roman/Medieval town of Vaison-la-Romaine. Orange with its Roman amphitheatre is 15 miles away. A little further away is Avignon with its Papal Palace (30 miles). The world famous aqueduct the Pont du Gard is 45 miles away, close to Nimes & its Roman amphitheatre. Scenic walks abound in the Dentelles mountains and around Mont Ventoux, the 'Giant of the Mountains', or canoe in the Ardeche Gorges. The Sault Plateau has spectacular views of the lavender fields. Villedieu is in the heart of the Cotes du Rhone, close to many famous wine producers - Chateauneuf du Pape, Gigondas, Vacqueyras & Beaumes de Venise.The beaches of the Camargue are 60-90 mins west, 2 hrs south-east are Cassis & Bandol. Internationally famous for antiques, Isle sur la Sorgue is an hour away. Golf: 9-hole golf course at Orange Golf which is within a 20 minute drive. There are 18-hole golf courses nearby at Avignon, Saumane and Montpelier. Ski: Mont Ventoux is about 12 miles away.